JGI's Tchimpounga Sanctuary Chimp of the Month: Gui! You are at:Home»Seriously Good For All»JGI’s Tchimpounga Sanctuary Chimp of the Month: Gui! Little Gui is Golfi's son. They live on Tchindzoulou island. One of the most rewarding things about JGI’s Tchimpounga sanctuary is that rescued, often orphaned chimpanzees are given and entirely new life with fellow rescued chimpanzees. These dynamics are truly unique and profoundly inspiring to watch. On Tchimpounga’s sanctuary island of Tchindzoulou, there’s one very special little chimpanzee who is providing the JGI staff a whole new world of inspiration and joy. His name is Gui! Gui is the son of Golfi, a rescued chimpanzee who arrived at Tchimpounga 12 years ago. 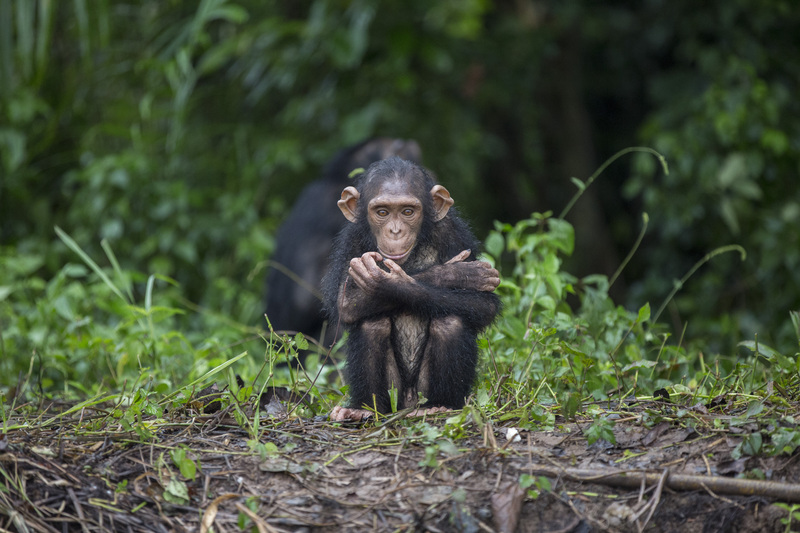 Though the Jane Goodall Institute’s Tchimpounga sanctuary provides birth control to the chimpanzees, as happens with humans – it can sometimes fail. Golfi’s son Gui is now five years old and as a little growing chimpanzees demonstrates great potential. Chimpanzees nurse until around five years old, and as such Gui remains very close to his mother, likely continuing to stay close and by her side for the next several years into maturity. The most exciting part of observing this young chimpanzee is the singularity of his upbringing: the freedom and social complexity of the island sanctuary sites allows him to experience a truly integrated chimpanzee community in a forest habitat. This young chimpanzee is a perfect addition to the group dynamics. He’s very playful and a favorite with the adult chimpanzees. 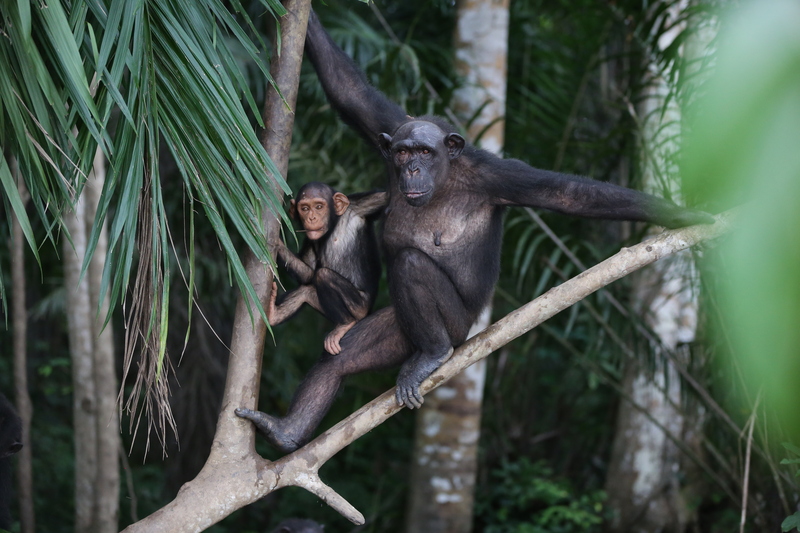 A few of the female chimpanzees of the group even give him rides around the island on their back, including one of his closest friends Ouband. Interestingly, the adult males also love playing with Gui, and they spend a great deal of time with him, treating Gui with care and tenderness. 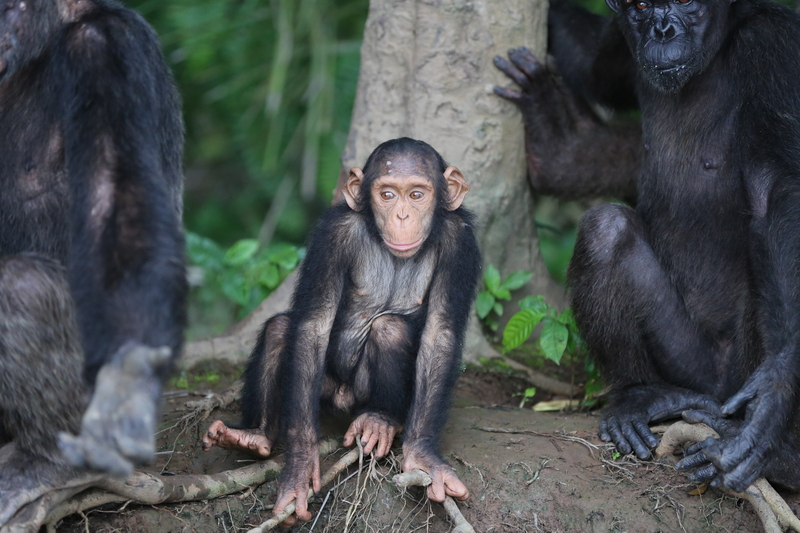 Chimpanzees like Gui, Golfi, Ouband and the others at Tchimpounga are given a second chance after being rescued from the illegal pet or bushmeat trade because of the kindness of people like you. Living on the island, roaming and interacting and growing, is a second chance they never would have had without you. You can symbolically adopt one of JGI’s rescued Tchimpounga chimpanzees by becoming a Chimpanzee Guardian today! Sign up here to support Gui’s care and to help us keep our promise to never turn away a chimpanzee in need. Next Article Research in Gombe is OFFICIALLY Guinness’ Longest Chimp Study!